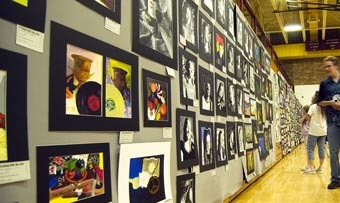 The Berthoud High School gymnasium will be transformed into an art gallery on Friday, May 7. It is time for the annual Evening With the Arts, featuring visual and applied arts by students in grades 6 to 12. The Berthoud schools have some extremely talented artists and the Evening With the Arts gives them an opportunity to show off their work and gives the public the opportunity to see what these students can do. The evening includes audio art as well, with the B H S Choir Concert in the commons from 5 p.m. to 6:15 p.m. and the Band Concert in the auxiliary gymnasium from 6:30 p.m. to 7:30 p.m. The Berthoud High School Forensics Team will also perform from 6:30 to 7:30 p.m. Their show will take place in the Commons. The Evening starts at 4:30 p.m. and lasts until 8 p.m. There will be plenty to see and do, if you should get hungry while there, refreshments will be available for purchase. Please come and support our young artists. Previous Story: Earthsky Tonight —May 3, Can you see Aldebaran near Venus? Site contents copyright © 2019 Recorder Online	except as noted. All rights reserved. | 86 queries in 1.129 seconds.